New Yorkers are the worst. Being from New Jersey this is something that I have always been intimately familiar with, but it wasn’t until a few years ago that a former friend of mine illustrated why. At the time, she was visiting me in Spain. It was a pitstop on her way back from completing her residency in the UK before returning home to graduate. And for reasons that left me completely aghast, she had very little interest in seeing anything, experiencing anything that Spain had to offer—not even the food. When pressed, she told me that because she was from New York, she already had access to the best versions of all the food in the world, and thus, saw no reason to travel and experience cuisine in their native lands. The only real reason she journeyed to the UK and later to Spain was to take photos for Instagram. Suffice to say, we are no longer friends. I just couldn’t muster the energy to continuing engaging with a person who was so employed such imbecilic logic. And while I wasn’t always the biggest fan of the food in Spain, the more I’ve travelled, the more I realized that some foods are just best left to the lands and people that birthed them. So, without further ado, here’s a list of the foods that I’ll never be able to enjoy again outside the borders of their native lands. I, on the other hand, was confused. “What the hell is hummus?” I thought; imaging possibly some sort of stew or even a new form of cake. When the teacher put the container of the yellowish pudding like substance, I followed behind the other girls by grabbing a raw vegetable and dipping it inside the concoction and placing it into my mouth. It was a decision that I regretted almost instantaneously. And it was also then that I decided that I could never trust white people. “What is this?” I thought as I swallowed down the strange metallic tasting paste. Up until that point, I had never even a tasted a chickpea and I was thoroughly unimpressed. In the years that followed, I avoided hummus like the plague. But by the time I reached my 20s, I had no choice but to gave in. It seemed that everywhere I turned, hummus was there to haunt me. It reared its flavorless face at every party and reception. And as someone who favors a plant based diet, it provided high quality plant based protein just could not be avoided. So, I ate it, albeit begrudgingly. When I started buying it for myself, I often went for the roasted garlic varieties in order to import some semblance of flavor. But last year, after a tub I’d forgotten about still hadn’t gone bad after being left in my refrigerator for weeks, I decided best to just make my own. This certainly improved matters, although, I wasn’t thrilled about this particular food stuff. But then I went to Turkey. And was served among a platter of several different dishes homemade hummus. And though it may sound hyperbolic, it is true—my life was forever changed. Far from the cold, flavorless paste, this hummus was warm, rich, flavorful and harmonized so well with the rest of the dishes that we’d been served. It was an experience that could only be replicated when I ate out because, oddly enough, you can’t find prepackaged hummus in Turkish supermarkets. When I asked my Airbnb host about this, he said that it was generally something that was made at home. And from that day I understood why. I didn’t think the Turkish hummus could be topped until my host in Palestine took me to a restaurant in the ancient city of Nablus. This hummus laughed in the face of its Anatolian cousin, calling out the audacity for the Turk to use its name. It was a culinary masterpiece in my mouth. One that immediately left me feeling both overjoyed and disappointed. I think that we are beginning to see a theme here. Not only did I fall in love with hummus while I was in Palestine, I also fell in love with falafels. This, like their chickpea counterpart listed above, were something else that I despised. And of course, it was for the same reason—a lack of flavor. For some odd reason, whenever these “ethnic foods” are transported to America, all the flavor seemed to be sucked out of them in the journey. And for me, that was the case with falafels. Before I came to Palestine, the only falafels I had ever eaten were dry and flavorless. Like hummus, I had no idea why the white liberals I knew were just so excited to eat a food that was so disrespectfully bland. I also didn’t understand why the Middle Eastern proprietors who served them were letting them live this lie and believe that this is the way falafels were supposed to taste. So, when my Israeli host drove me into Palestine to get a falafel, I was more than a little suspicious. He claimed, as an amateur chef mind you, that these were the best falafels around. But as someone who has had my fair share of dried out chickpea balls on even drier pita bread, I was less than excited. After placing the order, my host showed me how to properly assemble the falafel. Inside the wrap (not pita,) I could place pickles, french fries, lettuce, tomato, onions and an assortment of other condiments. There were also two types of sauce that my host insisted I put on. One was white and seemed to border between an aioli and ranch dressing. The other was bright orange can had a rather pungent smell. I applied a bit of both before heading back to the table to eat my meal. I sat down, took a bite, and shot up out of my seat to grab the bottle of orange sauce and dosed it on top of the wrap. I devoured the rest of the falafel ensuring that every bite was covered in the sauce. A few weeks later when I moved to Haifa, I brought my very own jar of this stuff and slathered it atop any and everything. Unfortunately for me, as I was leaving to head to Palestine, I left the sauce behind. And with it, any hope of ever tasting it again. While the sauce was served it Palestine, it couldn’t be bought the way it was in Israel. Or at least, I’ve never found it. I assume that it is the type of thing that people make at home and possible don’t think to or have no need to mass produce. In the weeks that have followed since I left, I’ve tried and failed to find the sauce online. When that didn’t work, I even asked my Palestinian friend, but to no avail. Alas, it seems like this sauce and its mysterious ingredients will remain in hidden to me; unless, I choose to journey to the Levent again. Now, I’ve always loved and enjoyed curry. Due in dual part to the proximity to both West and Southeast Indian people. The problem always came when I tried to remake their magic in my home kitchen. No matter what type of curry powder I bought, the ensuing curried dish always came out lacking. That is, until I came here to Thailand. While in the supermarket, I picked up a plastic package of curry of no particular style or flavor for less than a dollar. I took it home, stir-fried some veggies, tossed in the powder and my mouth exploded—with flavor. I have no idea what made this little packet different from the rest. Whether it was the location, the freshness of its production, or the ingredients used. But I will say that I will leave Thailand with a suitcase full of this stuff and will cry real thug tears when my supply runs dry. I say all this to say that if you, like my former friend, believe that you can find the best version of global foods in or near whatever culinary haven where you reside, you’ve got another thing coming. But this in itself is both the gift and curse of traveling; of engaging with cultures outside of your own in the actual places where they reside; of experiencing a cultural in its totality—not just the bits and pieces that may end up on your plate. So, unlike my former friend, I recognize that the best of the world has to offer cannot be gauged by those who have not and have no interest in seeing it. 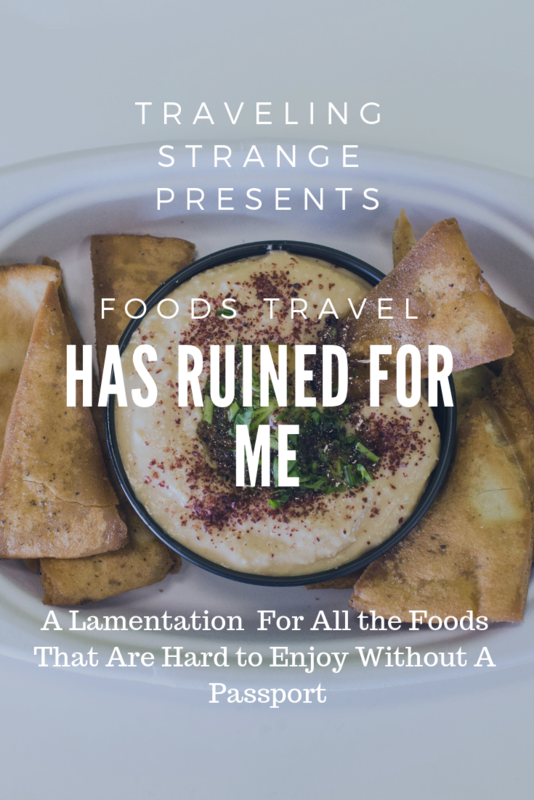 And take it from someone who has seen a bit more of the world than most—traveling has ruined certain foods for me. And I’m better off for it!